By way of introduction, I made the acquaintance of Pat a few years ago at Smith-Gilbert Gardens. A retired (English) teacher, she is an avid birder. I hope she will be kind enough to be a periodic contributor to this blog. While most of us are already in summer mode, the bird world is still exhibiting spring fever. Friday, June 13, was not an unlucky day for me at Smith-Gilbert Gardens (SGG) in Kennesaw, Ga., as I made the rounds of the garden looking for bird activity. I smiled at a House Wren singing at the top of a Red Cedar. I had seen a House Wren in that same spot about a month ago. Perhaps it was the same one, unlucky in love as he hasn’t found a mate yet. SGG is a bird nursery right now. After looking and listening to the House Wren for a while, I saw a bird on the ground near the flag poles. I did not recognize its markings right away, but its size and behavior (scratching at the ground and hopping backwards) was that of an Eastern Towhee. 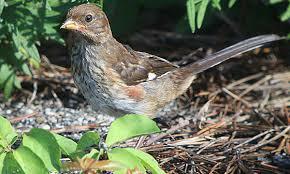 I assumed that this bird must be a juvenile Towhee. I checked my bird guide and matched this bird with the juvenile picture in the guide. They matched! Juveniles of any bird species can be very difficult to identify. Just like fawns who have white spots for camouflage, juvenile birds look very different from their parents, even their mothers. This, of course, is for their protection. 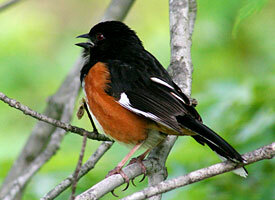 Notice the differences in the male, female, and juvenile Eastern Towhees in the following pictures. They all, however, have a small white patch on their upper wing. I had guessed the identity of this juvenile based on its behavior, which is a good reminder to all birders that you must take into account visual and audio clues, behavior, and range when trying to ID birds. Light, as well as your binoculars, can play tricks with the coloration of birds. As I continued on my walk, I spotted another juvenile. This time it was a Gray Catbird. 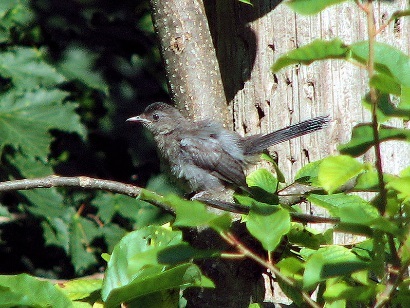 Juvenile Gray Catbirds look much like their parents except they appear fluffier. Like most juvenile birds, they are less wary of us. If I had approached an adult Gray Catbird as closely I had this juvenile, the adult would have quickly flown away. Usually, the juvenile’s parents are not far away and still are watching out for their offspring, so the juvenile is not completely defenseless. Another example of a juvenile bird’s immature behavior in regard to wariness occurred soon after I saw the Catbird. I was standing at the south end of the meadow looking at a male Brown Thrasher chase another male Brown Thrasher on the lawn when I heard a whooshing sound above my head. I looked up to see a juvenile Red-shouldered Hawk on a pine branch. He had a juicy caterpillar in his mouth and stared at me for a few seconds before proceeding to eat his breakfast. 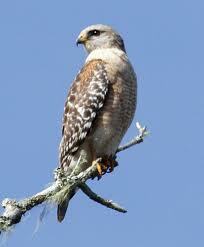 A mature Red-Shouldered Hawk would not have chosen to perch so close to an animal (me) that might be a threat to it. This was something that juvenile hawk still had to learn. After the juvenile finished his caterpillar, he flew to another branch higher up in a nearby pine. The juvenile began to vocalize with that high, clear cry…keeyur keeyur. One of his parents quickly flew to him. I’m sure that juvenile got a quick reprimand about having landed so closely to me. If you see a young bird on the ground, don’t assume it has been abandoned. Watch it for a while to see if a parent flies to it, or look up on branches to see if a parent is nearby. There is so much fascinating drama going on all around us in nature. Go grab your binoculars and get a front row seat!